One more of my work in progress quilts finished! That’s such a good feeling. Right up there with having all of the laundry done, folded, and put away. Except I’ll have to re-do the laundry every few days foreeeeeeeeeeeeeeveeeer. I made this quilt top two years ago and it’s been hanging so pretty in my closet ever since. Honestly I’m not head over heels for this quilt, but it is a sweet quilt and makes a perfect couch quilt for Sophie that the boys won’t steal from her. The fabric is a couple of years old so it will be hard to come by, but the cute line was called Milk, Sugar and Flower by Penny Rose Fabrics. The pattern is Yellow Brick Road by Atkinson Designs. I bound it with a favorite Michael Miller red stripe, and backed it with a soft white floral flannel. I free motion quilted it using my go-to for large quilts, the loopty loops. It’s just so easy to do loopty loops on big quilts like this (it’s almost a Twin size). 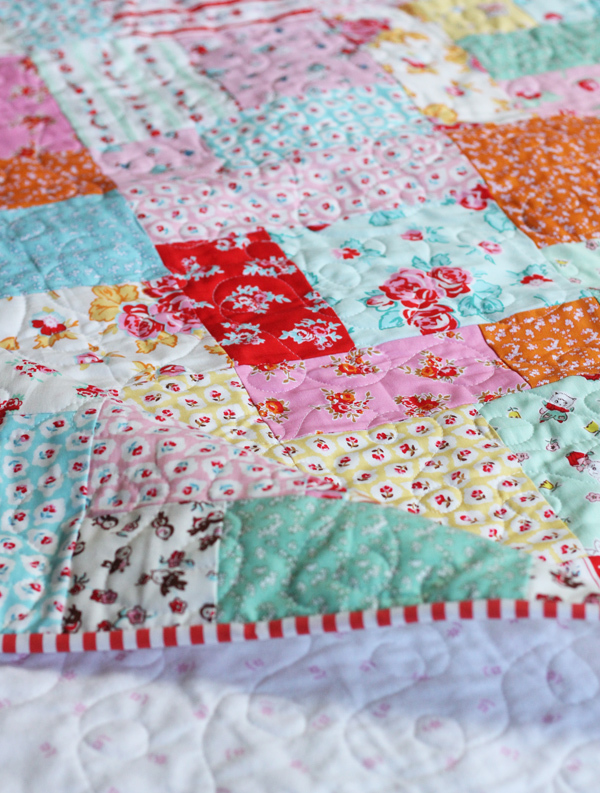 It’s a perfect quilt to finish in time for Spring and Valentines Day! Now on to the next WIP! Also because I’ll get asked, WIP stands for “work in progress” for those of you that don’t speak quilt yet. it’s so pretty! love the colorway! Very attractive quilt and I’m sure it will be loved for years to come. Doesn’t it feel good to scratch off one more WIP and call it DONE?!! I’ve made seven Yellow Brick Roads. It’s a great go to pattern that always gives a good result. Your quilt is charming! Lovely quilt! 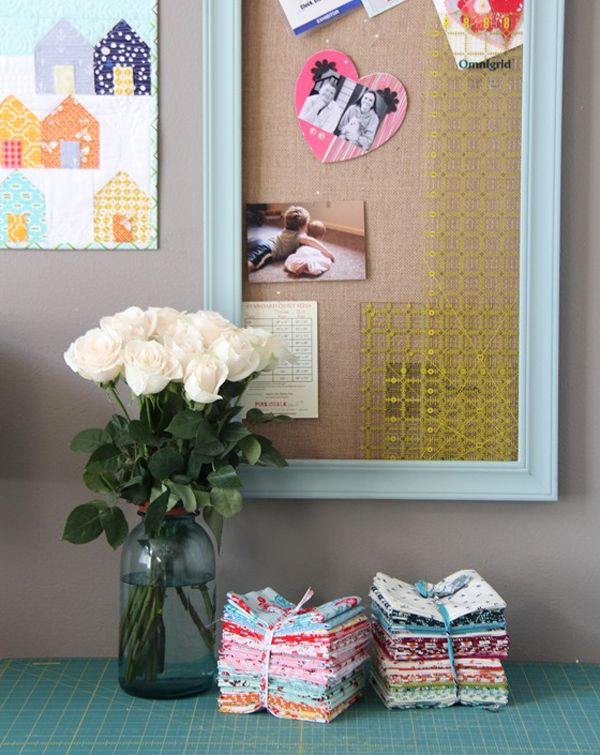 Can you tell me if the rulers are stored in a blank picture frame? Yep they are! Actually it’s a bulliten pin/board I bought at TJ Maxx…and it has a ledge that is perfect for putting rulers in. Kind of an odd use for it but it works so good! I love loopty loops too…always looks good and nice and quick :-). 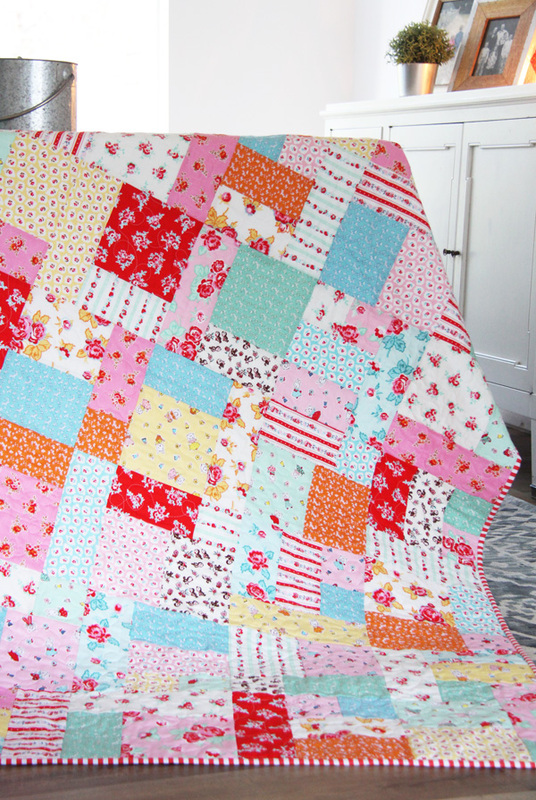 Love your quilt…very fun for your daughter and yes, the boys won’t pick that one up LOL. Just a little comfort on that laundry….it won’t be every other day forever and ever! My husband and I are empty nesters (we had four kids) and I bought enough socks and underwear to last us two weeks! I can actually manage to go two weeks now so I can quilt up a storm LOL. Hang in there! I think this is the sweetest quilt! The colors are just delightful. Quintessential Cluck! Congratulations on a big finish already in 2018. It is very sweet and I predict it will get a lot of use! It’s adorable and so charming for spring! I’m glad Sophie gets a quilt for herself! I’m glad you are doing well. I expect to see a new line of yours pop up any day now! I still haven’t used your last 1/2 yard bundle yet. It’s waiting for me. Hope your next line has similar colors. I’m so glad you love it! And yes…adding some pink to a quilt makes it boy-proof in my house. ;) Thank you for visiting! Love it! I loved these fabrics, and this is possibly my all-time favorite pattern. The laundry burden goes down when the birds leave the nest. There are things about that I like, and that I hate. I loved having them safely tucked beneat a quilt I’d made every night. I don’t miss the laundry though! MILK SUGAR FLOWER. I have TWO layer cakes in a zip lock bag. This quilt is adorbs, you know that. Allison, I just love every thing you make. Ive made yellow brick road many times. 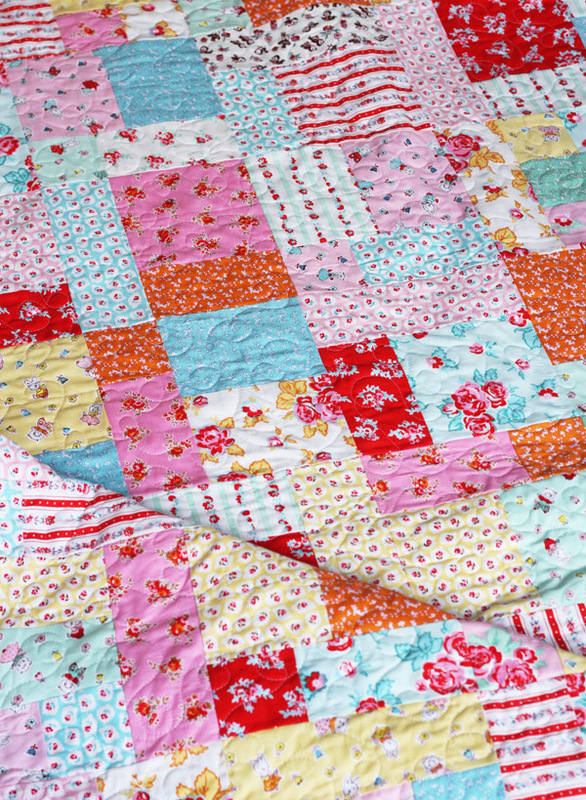 And I love it….boys wont steal her blanket, a girly quilt. I have pink tools! And my boys wont use em. Love this quilt! Feels so good to finish anything. I am still smitten with this fabric line. Just cut some pink for a Valentine’s Day quilt, so sweet! I love, love that fabric line! I have it in my stash, waiting for the right time to use it (maybe a grandchild?) because it’s so special. Hi Nancy! fatquartershop.com always has some nice Moda and other brand flannels, or fabric.com. This flannel was cheaper flannel from Joanns, it’s not the best but for this it worked. High quality flannel is so soft and washes better though…definitely buy that for grandbabies! 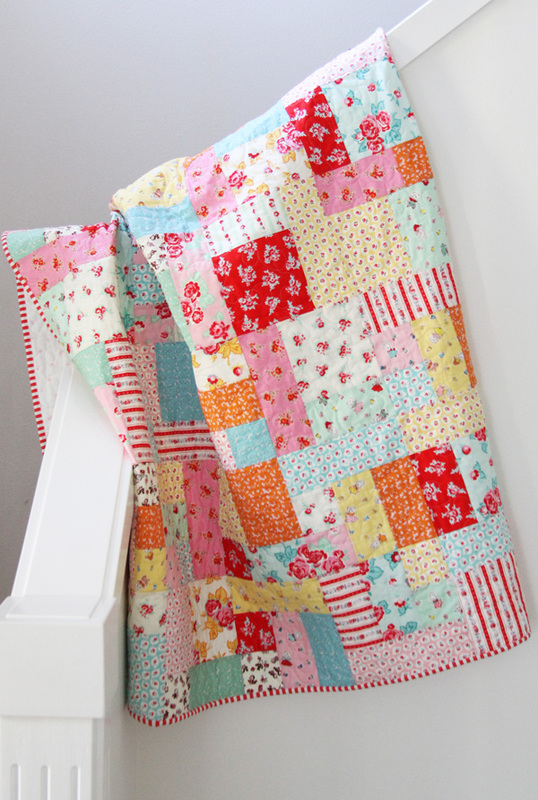 I back all of my baby quilts with minky…and it’s really easy you can do it! Just do a light spray basting (I have a tutorial for spray basting) and then also pin baste it just to be safe and you’ll have no problems. Honestly I think it’s a bit easier than flannel backing, as the flannel tends to pull against the machine during sewing a bit more and make it hard to move. Good luck!! 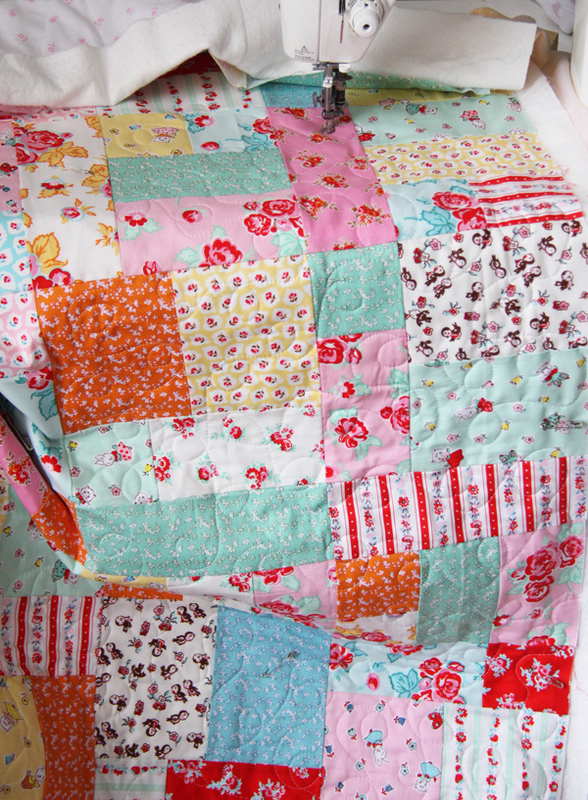 Love that line of fabric and how your quilt turns out.. 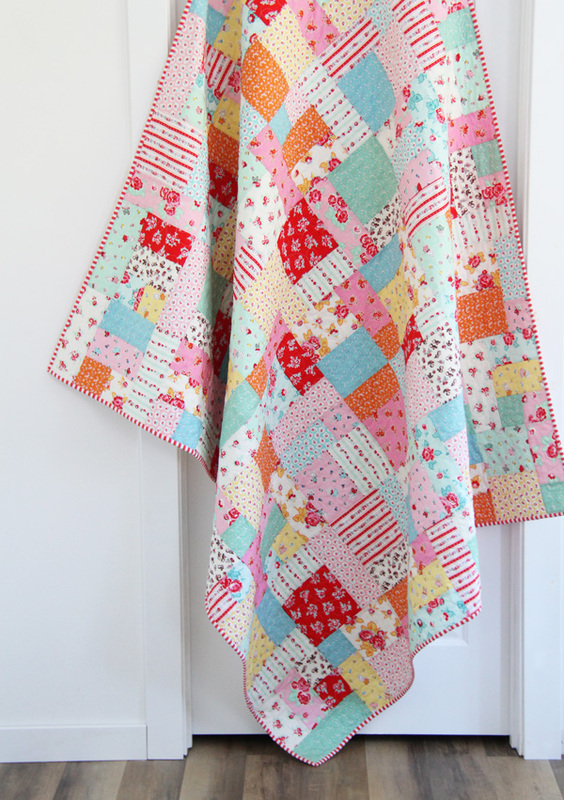 I am head over heels over this quilt–love the fabrics and the colors. Love that feeling when a quilt is finished and binded. I love bright, colorful quilts like yours. I quilt what I call “scribbling” on the machine. Kind of like your loops. Did you reduce the size of the blocks in the Yellow Brick Road pattern? I love that pattern too and I’ve made it many times. But the blocks seem too large for a baby quilt and I have thought about downsizing them but wasn’t sure what measurements to use. No I didn’t, but I made the throw size I think (it’s a huge throw…actually what I’d call a Twin). I haven’t tried downsizing those blocks but I agree they are too big for a baby quilt, you’d only have a handful of blocks. Great quilt, Allison! Nicely done. where could I find a pattern for this quilt? Love this quilt. Do you have a pattern/tutorial? The pattern is Yellow Brick Road by Atkinsons Designs.